And a mystery SUV crossover will arrive at the same time. The current Volkswagen Passat has been around since 2011 and the car is clearly showing its age. Other than being larger than many of its competitors, there isn't much that makes the Passat interesting. The Passat has never been an enthusiast's car, but that hasn't stopped VW from creating the new Passat GT. This sportier model has gone under the radar as one of the cars that we are most excited to drive in 2018. That's because it is basically a the Passat R36 that we never got in the US. The GT should help the Passat last another year in the US, but reports that Volkswagen plans to give the car a major refresh for 2019. Hinrich Woebcken, CEO of Volkswagen Group's North American region, spoke to a panel of journalists at the 2018 Chicago Auto Show about the next-generation Passat. 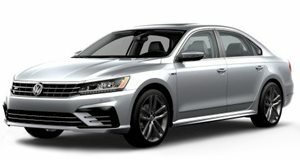 Details were minimal, but we can expect the updated Passat to become even bigger to differentiate it from the brand new Jetta. We can also expect a few styling cues from the like LED lights and sharper lines. The Passat will continue to be built at Volkswagen's plant in Chattanooga, Tennessee. Of course, no news about a new sedan could possibly be revealed without also mentioning a new SUV. Woebcken said VW plans to introduce two new models to market every year and that a new SUV should arrive alongside the Passat. This upcoming SUV is expected to be the same size as the new Atlas. It could end up just being a of the existing Atlas, but the more unlikely variant would be a coupe-like model akin to the BMW X6 and Mercedes GLE Coupe. Either way, we aren't surprised to see Volkswagen continuing its SUV onslaught in the US.